An elaborately crafted sign designed by renowned neon pop artist Todd Sanders is the latest addition to public art in Downtown Springdale. 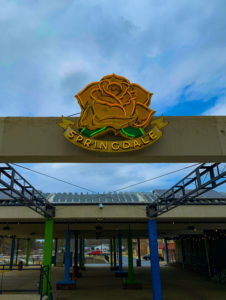 The sign, which features the name Springdale below a yellow rose, was recently installed above the entrance to Shiloh Square at Turnbow Park on Emma Avenue. As part of existing plans to remodel Shiloh Square, which included replacing the existing sign that had become discolored and in disrepair, the city of Springdale partnered with a private benefactor to secure the neon artwork on loan as a replacement. Sanders, who has hosted art shows of his work across the country, lists among his notable collectors Willie Nelson, Johnny Depp, Norah Jones and Russell Crowe. Among his corporate collaborations are works for Nike, Fossil, Anthropologie, LG Phone and Wired Magazine. Sanders’ most popular design, his animated, 5-foot by 30-inch “Fireflies in a Mason Jar,” originally was created for the wedding of Miranda Lambert to Blake Shelton.